Online Order Payment: Accepted forms of payment include credit and debit cards. We do NOT accept gift cards, pre-paid credit cards, Paypal, or international credit cards. Contact us if you wish to pay by cash, check or money order. Order Processing: Most orders are processed and shipped within 2-3 business days (Monday - Friday). All orders are individually reviewed by a member of our Customer Service Team. Please not that making changes after your order is placed may cause delays. Separate Billing and Shipping Addresses: Orders with separate billing and shipping addresses may be REQUIRED to use Signature Required Delivery. UPS adds a $5.00 per box fee for this service that will be added to your order total during processing. This fee is in addition to the total that is shown in your online shopping cart. Orders with separate shipping and billing addresses may take longer to process as we work diligently to prevent fraud. Expedited Shipping Orders (Overnight, 2-Day or 3-Day): MUST be placed before 12:00PM CT in order to ship out the same business day. Expedited orders received after 12:00PM CT will ship the following business day (Monday - Friday). If your order must be received by a certain date, please call us or note this in the comments section of your order. Closed On Weekends: Our office is closed on Saturday and Sunday. Orders are not processed, shipped, or delivered on the weekend (or on holidays), even with expedited shipping options. Orders are processed, shipped, and delivered on normal business days (Monday - Friday) only. Payment Processing: Your credit/debit card will be authorized for the full amount of the order when the order is submitted. The authorization will stay pending until your order ships. Once the order has shipped, the charge will go through and you will receive an email letting you know that your order has shipped and that your package(s) are en route. Deliveries: A signature is NOT required for your package to be delivered. If you are not home to receive your package, your UPS driver will attempt to leave your package for you (at the discretion of the driver), or take your package(s) to a nearby UPS access point (check your tracking number for details). If you wish to require a signature for delivery, please contact us to assist you in placing your order or note this in the comments section when placing your order online. There is a $5.00 per box fee that will be added during processing. Order Notification: After you place your order you will receive an email notification from us that contains your order confirmation number. Your order will also be hand-checked by a member of our Customer Service Team during the next available business hours. We will contact you if there are any problems or questions. If for some reason you do not receive an email, check your email's spam folder or contact us. Order Tracking: When your order has been picked up for shipment by UPS, we will send an email, to the email address initially used to place the order, that contains your UPS Tracking Number along with a link to the UPS website so that you can track your shipment. The email provides a main tracking number for the order. Your order may have multiple packages, each with its own tracking number. If you do not receive an email please check your spam folder or contact us. Dimensional Weight: Shipment cost is calculated by dimensional weight, also known as DIM weight, and is used by commercial freight services (including UPS). Dimensional weight takes into account the package density (L x W x H) to determine shipping rates, since space on delivery trucks is limited. Our products are packaged to arrive to you in the most cost effective and durable packaging to protect your investment. Occasionally there are unexpected delays due to weather. The scheduled delivery times CANNOT BE GUARANTEED when transportation networks are disrupted due to conditions beyond UPS’s control. We will do our best to update our website home page with any notices of delays that we receive. Check the News and Information section on the UPS.com home page for the latest updates that may affect your area. We accept orders from customers in the U.S. and Canada (having items shipped to their residence or business). For our American customers located on APO or FPO military bases or living in a U.S. 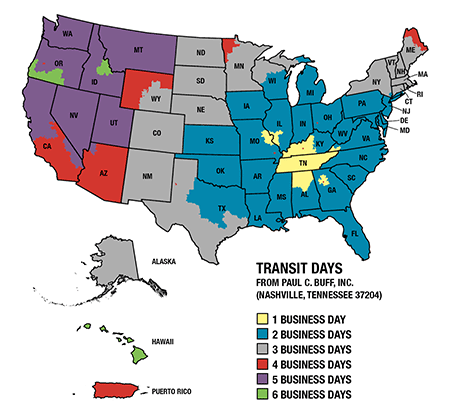 Territory, please contact us to determine the best and most cost-effective method of shipment based on the mail requirements for your specific location. For customers outside of the U.S. and Canada learn more about our authorized international options. Orders shipping to or associated with a freight forwarder, domestic or international, must pay in advance via wire transfer and the shipment will be signature required (a $5.00 per box fee will be added to your final total). Customs and Duties may be applicable. Brokerage fees are not included with UPS Ground to Canada. UPS will charge a brokerage fee to the customer, separate from the charges calculated in our shopping cart. With UPS Worldwide Saver to Canada, UPS brokerage fees are included, pending normal customs clearance. With either shipping method the receiver will still be responsible for any applicable duties and taxes. Canadian goods and services taxes are not included. When shipping any item into Canada via UPS Ground or UPS Worldwide Saver to Canada, customers will be required to pay UPS for the total amount of these taxes. When using UPS Ground to Canada a small disbursement fee ($6.00 USD or 2.7% of the value of the taxes, whichever is higher) will be added. A $10 bond fee will be added when using UPS Worldwide Saver to Canada. We offer two UPS Shipping Options to Canada. For our Canadian customers located in the Northwest Territories, Nunavut and the Yukon Territory, please contact us to determine the best shipping method for your location. Most orders are processed and shipped within 2-3 business days (Monday - Friday). All orders are individually reviewed by a member of our Customer Service team. Orders with separate shipping and billing addresses may take longer to process as we work diligently to prevent fraud. Making changes after your order is placed may cause delays as well. UPS Worldwide Saver is not an expedited shipping option, most orders will ship within 2-3 business days. Paul C. Buff, Inc.™ accepts orders from and ships orders to customers located in the United States and U.S. territories (including Puerto Rico, the U.S. Virgin Islands and Guam); U.S. military personnel living/working internationally; customers located in Canada; existing customers living in international locations (customers who have ordered from us before); and existing customers who previously ordered from PCB Europe or PCB Australia (former authorized international reseller). For details on international ordering, click here.